Soccer Advantage Rule is given to the team in possession. SOCCER ADVANTAGE RULE MAKES THIS GAME EVEN MORE ENTERTAINING. Soccer Advantage Rule is enforced by the Center Referee, where stopping the play would actually hurt the team being fouled by not letting the game continue. For example, Player 1 is dribbling the ball towards the penalty area. He gets fouled by the defender Player 2, but instead of stopping or falling down, Player 1 is able to recover and continue towards the goal. This is when the referee yells out "Play On!" with both arms extended, giving advantage of play, instead of stopping the game. 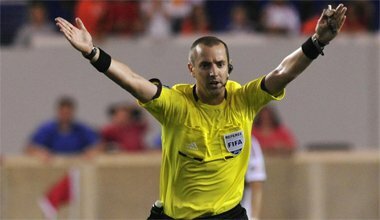 Soccer Advantage Rule is called by the center referee in an effort to keep the game flowing and more entertaining. Advantage in soccer happens when the player with the soccer ball is fouled or obstructed, but instead of stopping or falling down, he keeps going forward to score or pass the ball for an opportunity to score. Referee should raise his arms and yell Play On! Advantage rule clause will let the play continue if a foul is committed while the player manages to pass the ball to one of his teammates who are in a good position to score or move the ball forward. To make the game more fast paced and entertaining, referee will always look to give advantage to the attacking team. After the play is over and the ball goes out of bounds, the referee has the right to stop the game and produce a yellow or red card for the player that made the foul when the advantage was given. If the tackle was not harsh enough for the referee to caution anyone, game will continue like nothing happened. The Referee will signal the Advantage by raising both of his hands up in the air and yelling "PLAY ON!!!" Players should never stop playing until they hear the referee blow his whistle. That is the only signal that the game needs to be stopped. Advantage rule is something not every player wants. If the player DOES NOT WANT the advantage of play after the foul is committed, he should just stop with the ball, pass the ball back or kick it towards the sideline and out of bounds. This will show the referee that the attacking team wants the free kick instead of taking the advantage of play. Sometimes players get hurt in a tackle and cant really take the advantage of the advantage rule in soccer. Restart of the game will happen where the foul originally took place. Simply put, advantage rule is used by the referee to make the game more enjoyable for the fans and players. Advantage rule makes soccer more fast paced with less stoppages and dead ball situations. Advantage rule is enforced when the referee chooses to allow play to continue if an offense has been made against the team in possession of the ball. Referee will do this to give the attacking team a chance to continue the play in an effort to score a goal. The soccer advantage rule is supposed to improve the flow of the game and benefit attacking teams to score more goals. For more information on Advantage Rule in Soccer please visit FIFA The Referee - Law 5 of the Game.